Hastings United Football Club has made an impressive start to its pre-season friendly matches. The Bostik League South East Division team won 5-1 against the FFDTV academy side at Bexhill College on Saturday and 6-0 away to neighbours Westfield on Tuesday evening. Hastings manager Chris Agutter said: “We look physically very good and we’ve played some good stuff. Ansu Janneh (2), Sam Beale, Jack Dixon and triallist Bright Temba scored in the opening game, and the manager felt Jahmal Howlett-Mundle, Tom Vickers and Dixon played particularly well. Agutter said: “Saturday was a decent workout on a really tight pitch. Had it been on The Pilot Field, I think it could’ve been less meaningful. Daniel Ajakaiye scored a hat-trick, Janneh bagged another brace and Kelvin Ogboe got the other for a full first team against Southern Combination League Division Two side Westfield. “I think it’s important we fulfil certain obligations and it was an opportunity to support a local team whilst getting the players more minutes on the pitch,” continued Agutter. “It was another beneficial workout for more than just footballing reasons. “Supporters last season saw an injured Daniel Ajakaiye, but now they’re seeing exactly why I’ve pursued him for such a long time because he’s electric. Over 10, 15 yards, he’s just got blistering pace. “Ansu Janneh has started to show glimpses of what he did around Christmas time last year when he was a mainstay in the team. The two goalkeepers have played 45 minutes in each game, while the outfield players have played at least an hour a time, some 75 minutes. 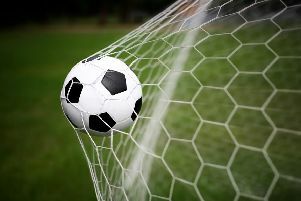 Agutter says that pattern is likely to continue when Hastings face Southern Combination League Premier Division new boys Little Common at Bexhill College tomorrow (Saturday), kick-off 1pm. He then plans to split the squad for the games at Newhaven on Tuesday and AFC Uckfield Town on Wednesday, with half the squad going to one game and half to the other, in an effort to increase players’ minutes on the pitch. Both squads will be topped up by youth team players. Mark Stapley has taken sole charge of Westfield after his son Jack, with whom he had been sharing the managerial duties, stepped down to take over the chairman’s role from Graham Knight.